Hot off the heels of Ironman Canada comes a story that’s bound to get you out of bed. While not strictly “Mountain Life”, it certainly is worth sharing with you. Eric Hites is a 560lb Indianan who decided to change his life for the better. Already the author of a cookbook entitled “Everybody Loves Ramen” (seriously), he has since decided that his weight has become enough of an issue to do something once and for all. Hites has commenced a cycling trip from the East Coast to the West coast. Already an impressive feat for your average Joe, he has called this his “defining moment”. 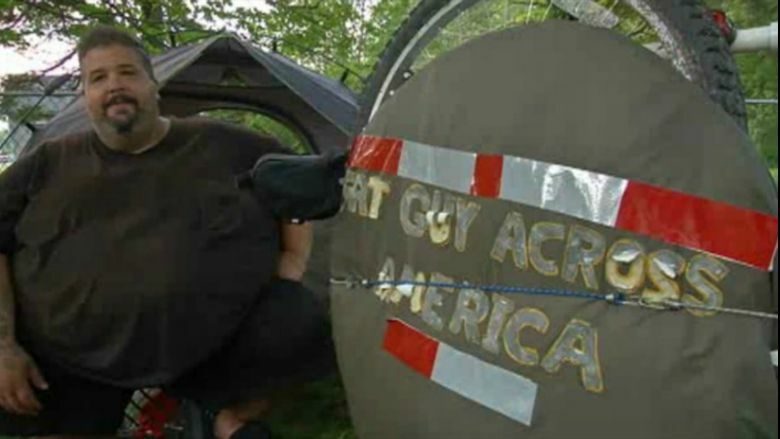 This post is just here to let you know that you can keep an eye on this awesome journey at fatguyacrossamerica.com (the journal is especially interesting). Hites is currently in New Bedford, Massachusetts – still a long way from the finish line, but further than his front door.